My first reaction upon hearing about Nokia’s 41-megapixel 808 Pureview was that it was an absurdity, a perfect example of the very worst of consumer electronics, and a total miss. But the more I read, the better I understood that this phone isn’t just some freak of nature with a ridiculously high number attached to it. It’s just the slightly awkward first steps of a serious move by Nokia to differentiate itself. If you’ve only skimmed the news, there are some things you should probably know about this strange beast of a camera. First, the 41 megapixel figure is really misrepresentative, not to say untrue. It doesn’t take 41-megapixel photos in any way, shape, or form. Even in the special high-res creative mode, it “only” produces 38 megapixels. Mostly it will be taking normal-size shots, between 3 and 8 megapixels. So what the hell does this 41 megapixel figure even mean? 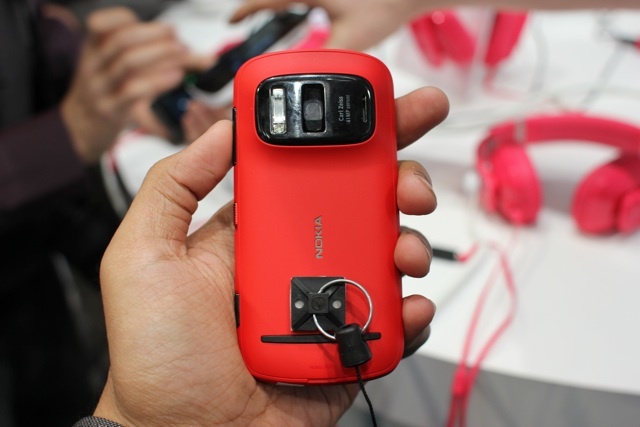 It means Nokia is being smart about the way cameras at this size actually work. I wrote a while back about how HD does not always mean high definition, and cameraphones were an excellent example of this. Their tiny sensors and bad lenses meant that while they may produce pictures of a certain size, the quality was sorely lacking. This was because they insisted on wringing every possible pixel out of an incredibly small sensor. The 808’s sensor (supposedly manufactured by Toshiba) is not small. 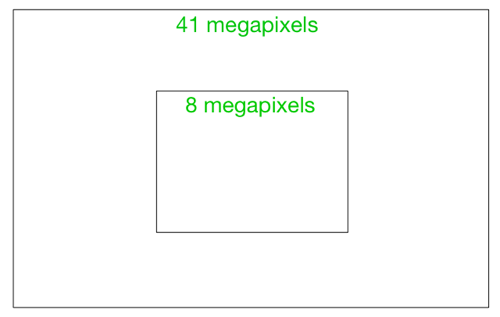 At 1/1.2″, it’s four or five times the size of most cameraphone sensors, including the one in the iPhone 4S. Bigger in fact than the sensors in most point-and-shoots. Now, when you make your sensor bigger, you can either keep the same resolution but have bigger wells or photosites (which detect light and make up pixels), which usually improves sensitivity. Or you can keep the same photosite size and just put more of them on the sensor, which improves resolution. In this case Nokia has done the second thing. But they’ve done it almost to an absurd amount, and they know that their lens, good as it is (and fairly fast — F/2.4 is solid, though there’s lots of distortion right now), can’t really resolve detail well enough that 41 megapixels would be necessary. Even on full-frame cameras that many pixels is questionable. So instead of just bumping this one spec and expecting it to sell itself, they built a whole photo system around the idea. The 808 camera doesn’t take 41-megapixel photos; it collects 41 megapixels of data and uses all that data to create a very nice photo of a much smaller size. 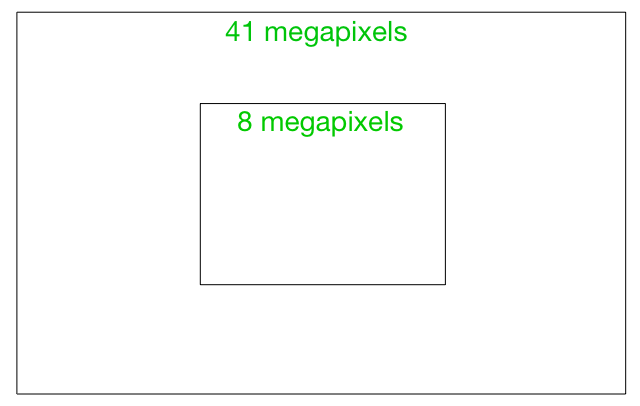 Imagine a photo around 8000×5000 pixels that isn’t particularly sharp; now shrink it down to something significantly smaller — maybe around 3000×2500 pixels (~8MP), just as an estimate. You do it intelligently, sharpening and de-aliasing and doing noise removal. They’re using 41 megapixels of raw material to give you 8 megapixels of product. And that 8 megapixel product is going to be significantly better than a “real” 8-megapixel image captured by a sensor a quarter the size of your pinky fingernail. Their camera really is better. Of course, this comes with the standard caveat that independent testing must be done and what really matters is how it performs in everyday situations like dimly lit kitchens, restaurants, and out of the windows of cars. We’ll try it out ourselves, and will be sure to let you know if any more photographically-inclined authorities find out anything interesting. And then there’s the handset itself. It’s chunky, it’s a weird shape, the camera sticks out the back. And it runs Symbian. Symbian! Why would Nokia do such a thing? Because this project has been going on for five years, and five years ago the idea that Nokia and Symbian would be fighting for dear life wouldn’t quite have been believed. Nokia was still king of the world, iOS was just being born, and everyone was looking forward to Limo instead of Android. They’re running it on Symbian because it was designed for Symbian, and it was too late to port the software and adapt the hardware to Windows Phone 7, which came along at the 11th hour, and at any rate the design spec for their Lumia phones would never have admitted a lens bump like the 808’s. But they’re promising to bring the whole package to WP7 — which means Microsoft just got five years of Nokia R&D for free. It also means that if these guys play their cards right (a big “if”), WP7 could be the de facto gold standard for mobile photography in a year or two. When you consider how point and shoots are giving way to camera phones, and WP7 is aiming at the exact population that loves point and shoots, the pieces start looking very complementary indeed. Nobody will buy the 808. It’s an evolutionary dead end. But the camera is a desirable trait that will be introduced to the Nokia-Microsoft hybrid soon — if either of these companies has any sense. Again, that’s a big if. But this camera has restored some of my faith in Nokia and in mobile photography, something I truly didn’t expect to happen any time soon, and not by them of all.